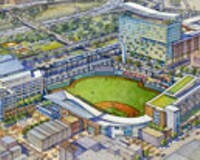 Does the Mayor Have the Votes to Get His Ballpark Plan Through City Council? | Street Talk | Style Weekly - Richmond, VA local news, arts, and events. 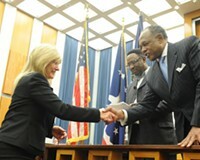 City Council President Charles Samuels is sworn in last January as Mayor Dwight Jones looks on. Jones needs seven votes to get his ballpark plan passed. Richmond Mayor Dwight Jones introduced his proposal to put a ballpark in Shockoe Bottom with much fanfare Monday, but it still faces an uncertain fate in City Council. Because it will require the transfer of city property, the mayor needs support from seven of nine council members to make the park a reality. Here are some early predictions about how the vote is likely to shake down. Five likely yes votes: Jon Baliles (1st District), Kathy Graziano (4th District), Ellen Robertson (6th District), Cynthia Newbille (7th District), and Michelle Mosby (9th District). These council members generally are supportive of Jones, and the mayor has put together a plan that – at least on paper – is politically safe: He says it will create 400 jobs and generate $200 million worth of tax revenue over 20 years, thus helping to address the city’s 26 percent poverty rate. On top of that, the business community is behind it. No matter what questions are raised about the analysis behind the numbers – and there will be questions raised – more jobs and tax revenue make it easy for council members to explain their support to skeptical voters overwhelmingly opposed to the concept. 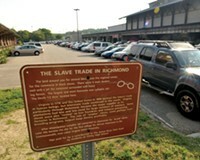 Jones’ plan also addresses the area’s slave history by providing for the development of a slave heritage site. It may not be enough for some opponents who say the narrow strip of land under consideration doesn’t adequately convey the enormity of the trade here. But for the purposes of most council members, it not only addresses the issue, it achieves the creation of a memorial area that many leaders have sought for over a decade. One likely no vote: Parker Agelasto (5th District). Agelasto has made it clear in the past that most of the people in his district don’t support the proposal and that he, too, is unlikely to support it. Elected less than a year ago, Agelasto has turned out to be a frequent critic of the administration and (in its eyes) an annoyingly prolific asker of questions. No one is likely to spend much time trying to win him over. Three toss-ups: Charles Samuels (2nd District), Chris Hilbert (3rd District), and Reva Trammell (8th District). The mayor’s team needs to persuade at least two of these council members to get on board. Trammell is unpredictable and no fan of the mayor, but she also represents a district that faces high poverty rates and lacks amenities -- for example, sidewalks -- that other districts have. If she’s persuaded this plan really will broaden the tax base and create jobs, then she might support it. Hilbert’s background is in finance and he’s said his support depends on how good the numbers look once he sees a detailed breakdown. He’s also said he’s concerned by the vocal opposition some respected historians have expressed about the plan. Hilbert was a holdout on the Redskins training camp, but ultimately, he voted for the deal after the administration agreed to put more money toward schools, one of Hilbert’s priorities. Council president Samuels is not a fan of the idea. He’s the council member who two months ago tried to head-off the administration’s ballpark announcement by calling for a city-wide referendum on the issue. That didn’t happen, but Samuels has repeated that his support will depend on what his constituents say. 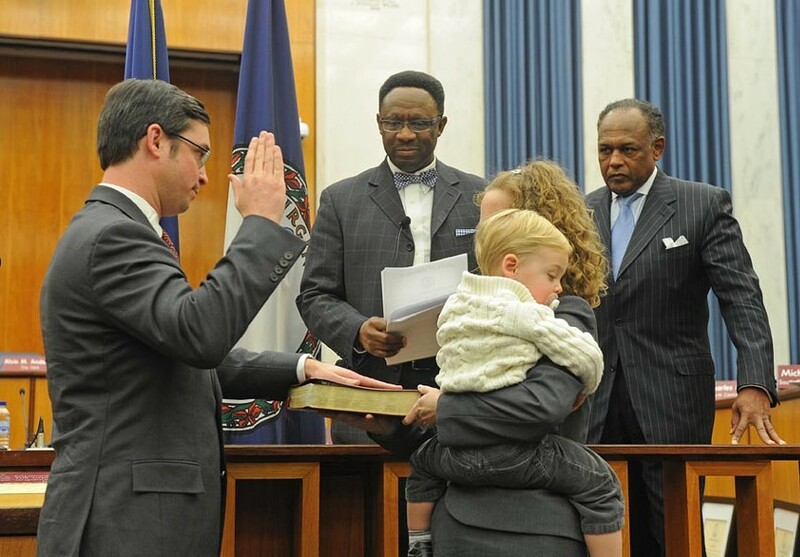 He could be swayed by Sen. Tim Kaine’s decision to back the proposal. The former mayor and city councilman came from Samuel’s district, still lives there and is well respected. 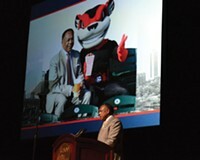 A second City Council member comes out in opposition to the mayor's ballpark proposal.